Independent living is defined as “those skills or tasks that contribute to the successful independent functioning of an individual in adulthood” (Cronin, 1996). We often categorize these skills into the major areas related to our daily lives, such as housing, personal care, transportation, and social and recreational opportunities. Each student’s needs in the area of independent living are unique and should be determined through informal and formal age appropriate transitional assessments. The desire to become self-sufficient is a natural part of growing up for students with and without disabilities. The acquisition of independent living skills can significantly impact a student’s future and the quality of his or her life. Therefore, the potential need for developing these life skills must be discussed during the transition Individualized Education Program (IEP) planning process. Remember, the ultimate goal of independent living is assisting individuals to live as independently as possible or desired through the choices they make about where they live, play, learn, and work in their communities. Who Needs Independent Living Skills Instruction? One question facing teachers is: which students with IEPs need postsecondary goals for independent living? The short answer is: it depends. Decisions regarding the need for independent living skills instruction should be made by the student’s IEP team members after they review the youth’s postsecondary goals, present levels of academic and functional achievement, and transition assessments. Independent living needs vary greatly among students and it is important to remember that there is a wide continuum of skills leading to independence. For example, while one student may need travel training to access public transportation, another may need driver’s education to obtain his driver’s license. Some students may need to learn which coins are needed for a vending machine while others need to learn how to budget monthly housing expenses. Special consideration should also be given to students who are culturally and linguistically diverse. For example, some cultures do not value living on one’s own as a sign of independence. Below are some examples of areas for consideration when planning for independent living. Besides work and postsecondary education, it is important to plan where a student will potentially live. Some youth may transition to supported housing offered through insurance or Medicaid Waivers. Others may plan to live with family members. Some students may move to an apartment or dormitory. It is also important to consider community supports that can assist students and their families to prepare for independent living. For example, approximately 15 Centers for Independent Living (CILs) are located throughout the Commonwealth of Virginia. These centers, funded in part by the Department for Aging and Rehabilitative Services, work to remove barriers to independence and to ensure the equality of persons with disabilities. Center employees work with school divisions and Community Services Boards (CSB's) to provide basic independent living skill training and other resources. Teachers might consider collaborating with a local CIL if one is available. Students who are exiting foster care placements might need assistance with housing. If a student has a Department of Social Services (DSS) case manager, invite that person to the student’s IEP/transition meetings. For example, a teacher worked with a local Community Services Board (CSB) and DSS staff to assist a student who was turning 21 years old and ready for work. Working collaboratively, they found this young man an apartment that met his needs: close to both his new job and a bus stop. There are so many activities involved in personal care! 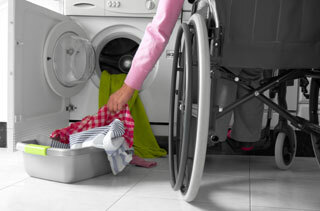 Personal care needs can be related to hygiene, eating healthy, exercising, bathing, dressing, grocery shopping, meal preparation, laundry, and securing a personal care attendant. While it may be uncomfortable to discuss personal care needs in an IEP meeting the issue must not be ignored. It is vital to take a holistic approach during transition planning and to understand how unmet needs in one area of a student’s life can impact another. Personal care attendants and numerous other personal care services/activities cost money. For many families these costs can be daunting and overwhelming. Planning for independent living also must include discussions regarding funding sources for services. One method of paying for personal care is through health insurance (Medicaid or parents’ insurance). If a family you are working with needs to begin researching Medicaid in Virginia, The Virginia Medicaid Program: At a Glance provides valuable information. The Affordable Care Act provides insurance coverage for youth and young adults through age 26 on a parent’s policy. Individual plans may vary; some carry the student through the end of the month of his/her birthday. This topic could be discussed with students and their families as part of transition planning. It is very important to plan ahead so that funding sources can be secured to support personal care needs. How will students access their community? Is mass transit available in the student's neighborhood? Although public transportation is slowly gaining increased availability, it remains more predominate in areas with the greatest population concentration and simply nonexistent in many other areas. In areas with public transit, many students need to be taught how to use the mass transit system to go to work, shop, and enjoy the social and recreational opportunities of their choice. In areas with no public transportation system, navigating one’s community through shared rides or by walking is still an important skill. Lack of transportation continues to be recognized as one of the greatest barriers to employment, higher education, postsecondary training and community integration. Finding creative solutions to transportation is often key for an active and full life in the community. In southwestern Virginia, one school division faced a transportation issue as they began planning for a new employment program: Project SEARCH. This employer-based internship program was located in a hospital at one end of the county. A regional transportation system existed in which a bus traveled from a fire station at one end of the county to a community college 65 miles away. Many of the student interns lived in the middle of the county; carpooling or family transportation was unavailable. An agreement was reached with the bus company to create new bus stops at both the hospital and a local retail establishment in the middle of the county. The interns obtained transportation to the bus stops. It took a strong team effort with the Department for Aging and Rehabilitative Services and the school division to make this happen. This is one of many examples of how working collaboratively with local agencies can produce results! Having friends and belonging to a community is an important part of adult life. All individuals with disabilities should be allowed to make choices about where and with whom they spend their leisure time. Their self-determined decisions ought to guide their social and recreational pursuits. While students are still in school, they may practice certain leisure skills to determine preferences. It is important that these students have opportunities to access social and leisure activities in natural, integrated settings. Some students may prefer quiet and solitary activities; again, learning to choose preferred settings will set the stage for adult life. Many middle schools teach students to join clubs; students with IEPs may join any or all clubs based on their interests. This enables all students to feel a part of their school community.